A hard fought encounter in Birmingham saw Bedford Athletic go down 22-10 at Birmingham Solihull in their National Three Midlands fixture on Saturday. The hosts took the game to their visitors from the kick off and it was a torrid first 10 minutes for the Athletic players as they repelled wave after wave of attacks. 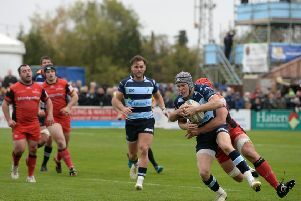 Birmingham eventually settled for a 12th minute penalty slotted by fly half Mitch McGahan, before Josh McCann retired hurt and captain Rob Watkins was in the blood bin when the Bedford Athletic try arrived. A well executed line out move saw Stephen Woodhead break the defence and score his second try of the season which James Mortimer converted on 20 minutes. Further chances were to come Bedford’s way as they took a grip on the game. A 30 metre driving maul was hauled down just short of the line and then a great line break from Steven Smith saw him make 50 yards before the subsequent passing movement saw the ball go to ground. Nevertheless Bedford Athletic profited when Mortimer kicked a drop goal for a 10-3 lead on 27 minutes. Birmingham were awarded a penalty try and added the extras to level on the stroke of half time. The second period opened with Birmingham in the ascendancy and Bedford Athletic conceding too many penalties. Chris Fensome went over, before play was held up following a collision in midfield that saw Mortimer and Birmingham wing Chipadza Tawauda leave the field with concussion. The hosts pressed on hoping for further scores but the Athletic defence held firm often managing to turn the ball over. However, Birmingham remained on the front foot as Matt Spink touched down on 72 minutes. The visitors did force some late opportunities with two line-outs deep in the Birmingham half but once again they were insufficiently accurate and the chance of a losing bonus point was spurned. Bedford Athletic host Bridgnorth on Saturday.